Klemperer was a busy man in 1957 and thereabouts. Having polished off the Brahms symphonies (Pristine Audio PASC360-362) in the springtime, he soon set to work on the Beethoven canon. October alone saw recordings in London's Kingsway Hall of the bulk of the series - all or part of the First, Second, Fourth, Sixth, Eighth and Ninth were taped in stereo during this month, together with the Coriolan Overture present in this volume. It's true to say that the recordings were very well made for their day - better perhaps than the Brahms which had preceded them. XR remastering here isn't a question of rescuing a dismal historic artefact; rather it's a case of eliciting the very finest sound quality possible from from fine source material - digging deep into the bass for added richness; opening out oft-constricted strings; lifting a veil from the upper treble. In short, whilst the current EMI transfers are perfectly acceptable representations of what was possible in 1957, these Pristine remastering offer us what more could have been heard had Klemperer and the Philharmonia had a 21st century recording facility to work with. It's one of those classic series of recordings which merit the very best sound quality - and which should stand thus in every collection. BEETHOVEN Symphony No. 3 in E flat, Op. 55 "Eroica"
After reviewing Andrew Rose’s disappointing remasterings of Otto Klemperer’s Brahms symphonies for Pristine Audio, I wasn’t sure what to expect from Rose’s versions of the same conductor’s Beethoven symphonies. Happily, the results here are far more successful. 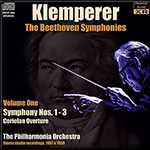 Rose states that his objective is to create a sound “had Klemperer and the Philharmonia had a 21st century recording facility to work with.” I’m not sure that’s an entirely realistic goal given the quality of the source material, but Rose endeavors bravely to achieve it. I had on hand Andrew Walter’s 1998 EMI remastering of the Second Symphony for a comparison. The EMI version possesses decidedly better tone color throughout the orchestra. However, the string sound often is congested and there is little or no hall ambience. What’s more, the orchestral balance is not good. Andrew Rose’s remastering is decidedly easier to listen to. The problems of balance are addressed expertly, and the strings clearly inhabit the same space as the rest of the orchestra. Rose has improved the dynamic range, and the spatial extension of the brass is quite impressive. Nevertheless, problems remain. The hall ambience, while clearly better than EMI’s, is too generic. One cannot tell if the recording was made at Kingsway Hall, Abbey Road, or in an aircraft hangar. The string sound at times is papery, not a true representation of the lovely English strings of the Philharmonia. All in all, Andrew Rose has given us a good remastering, yet perhaps only a stopgap on the road to something better in the future.